Strengthening your connection to the natural world can leave you smarter, happier and healthier. 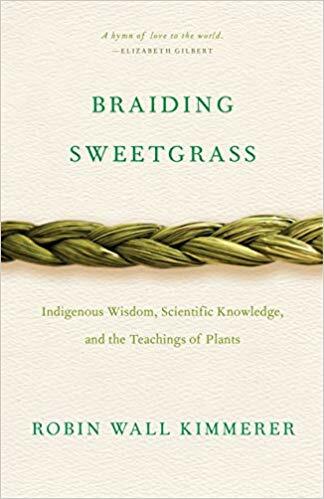 From the publisher: Drawing on her life as an indigenous scientist, and as a woman, botanist Robin Wall Kimmerer shows how other living beings―asters and goldenrod, strawberries and squash, salamanders, algae, and sweetgrass―offer us gifts and lessons, even if we’ve forgotten how to hear their voices. 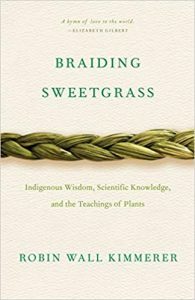 In reflections that range from the creation of Turtle Island to the forces that threaten its flourishing today, she circles toward a central argument: that the awakening of ecological consciousness requires the acknowledgment and celebration of our reciprocal relationship with the rest of the living world. For only when we can hear the languages of other beings will we be capable of understanding the generosity of the earth, and learn to give our own gifts in return. This won't be your average book club. Join us on the last Wednesday of the month from 6:00 – 7:00ish for a lively conversation sure to make you think and maybe even inspire. Each month’s book will help shine some light on all the different ways we connect to the natural world. From hiking to wellness to farming, physics, plants and who knows what else, there will be something for everyone. And if a particular title isn’t for you, don’t worry about it. We’ll see you for the next one! It wouldn’t be Happy Hour without food and drink, though. Each meeting is BYOB but we’ll provide some light snacks. But that’s not all. Each month, we’ll also send out links to optional podcasts, articles and videos that compliment our book choice to give you even more to consider. When we can, we’ll also feature guest speakers that will help frame our reading within a local perspective. Come treat yourself to an hour of great ideas and conversation! I’ve registered but where do I get the book? We’re proud to partner with Bank Street Book Nook, our local, independent book store here in New Milford as well as with the amazing New Milford Public Library to give our participants two great ways to find these titles locally. The Book Nook will have copies of each month’s title at a 10% discount at the start of each month and the NMPL can help you find copies for borrowing. If you’re having trouble finding the book, just let us know and we’ll see how we can help. Wondering what we’ve read? Want to catch up?